The radial head is the top of the radial bone, located just below the elbow. The radius runs from the wrist to the elbow, and fractures in this bone often occur near the top of the bone, or the radial head. A radial head fracture may be caused by a fall or a sports-related injury, and in some cases, a radial head fracture may occur when the elbow has been dislocated. Symptoms of a radial head fracture include elbow pain and swelling, and difficulty bending the elbow. It also may be difficult to move or turn the forearm. A radial head fracture is diagnosed through a physical examination and the doctor may attempt to move the arm into different positions. X-rays are performed to determine the degree of displacement and the severity of the fracture. CT scans may also be performed, and after a review of these images, an appropriate treatment plan is developed. In severe cases, when the radial head bone has broken into multiple pieces that cannot be put back together for healing, a procedure known as radial head replacement may be performed. During this procedure, the deformed radial head is surgically removed and replaced with a prosthetic radial head. 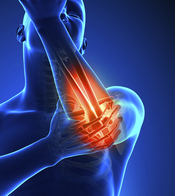 This surgery may be performed to improve long-term function of the elbow. Physical therapy is necessary after all forms of treatment for radial head fractures, and may include exercises to restore muscle strength, range of motion and flexibility.